On August 28 HunterMaclean, the Brunswick Golden Isles Chamber of Commerce, and the Brunswick/Glynn County Economic Development Authority presented a half-day of events focused on economic development for Brunswick and Glynn County. More than 100 business and civic leaders attended the HunterMaclean Critical Issues Forum and the Brunswick/Glynn County Economic Development Forum. The day began with the Critical Issues Forum, which featured former mayor and current city commissioner of Rome, Ga – Evie McNiece. Ms. McNiece spoke about the tremendous growth that her city has experienced in the last 20 years, providing specific information on how Rome revitalized a historic downtown and attracted companies like Lowe’s to the area. The rest of the morning was devoted to the Economic Development Forum, a co-presentation by the Chamber and Economic Development Authority (EDA). The attendees were welcomed and given an overview of the day by the organizers, Woody Woodside of the Chamber and Mel Baxter and Chuck Scragg of the EDA. Mr. Scragg then moderated a panel made up of economic development luminaries: Chris Clark, President of the Georgia Chamber of Commerce, Scott McMurray of Georgia Power Economic Development, and Betty McIntosh of Cushman-Wakefield. 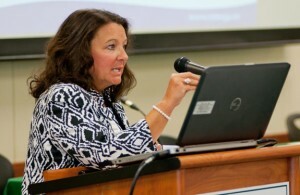 A facilitated group discussion was then led by Peggy Jolley of Georgia Power.